Known for abstract expressionism, artist Jonas Gerard thrives in the world of large, vibrant, acrylic paintings on canvas. After moving his art business from Miami and establishing himself in Asheville’s River Arts District (RAD), Jonas Gerard is celebrating ten years as a gallery owner in Asheville. 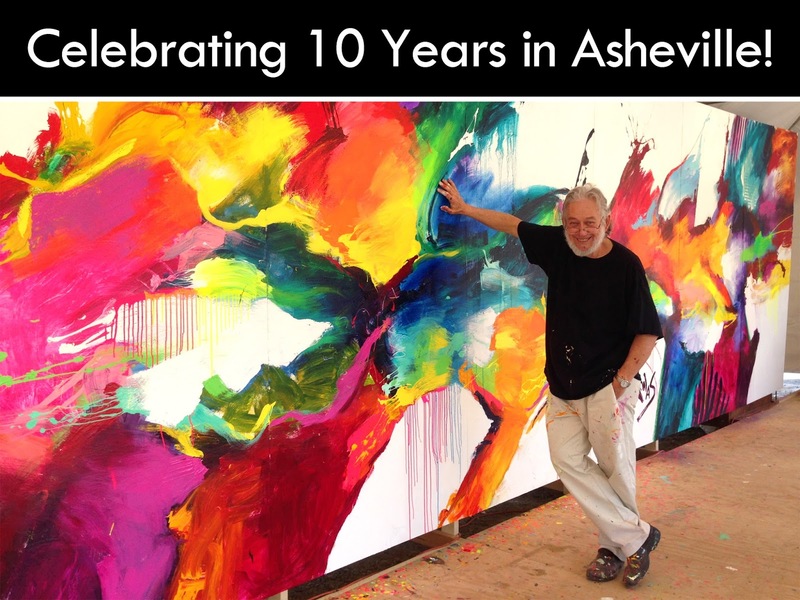 In coordination with the Asheville Chamber of Commerce, Jonas Gerard Fine Art invites the public to its 10th Anniversary Ribbon Cutting on Thursday, May 18th, 4:00pm at the gallery on 240 Clingman Avenue, Asheville, NC, 28801. There will be refreshments served and everyone present will receive a free signed art print. With a passion for adding color to the community, Jonas has installed multiple sculptures and murals in public places within the city. Throughout Asheville his paintings can be found in multiple hotels, a performing arts theatre, the Asheville Airport, Chamber of Commerce, doctors’ offices and a physical therapy facility. Jonas Gerard Fine Art now has two large gallery locations in the River Arts District that are open every day, all year round. The River Arts District (RAD) started out as a small community of artists and craftsmen has evolved into a diverse group of more than 220 working artists in studios and galleries housed in 22 former factories and industrial buildings along the French Broad river near downtown Asheville. RAD galleries feature paintings, mixed media, ceramics, sculpture, jewelry, clothing, photography, tapestry, blown glass, woodworking, basketry, and much more. The district is also home to multiple breweries, cafes, restaurants, music venues, a farmers market, and a diversity of other independent businesses.